I had planned to continue discussion of the masks of Francisco “Pancho” Parra today, but I realized that I was uncertain about certain details. I am postponing that post and substituting the one that was to follow. 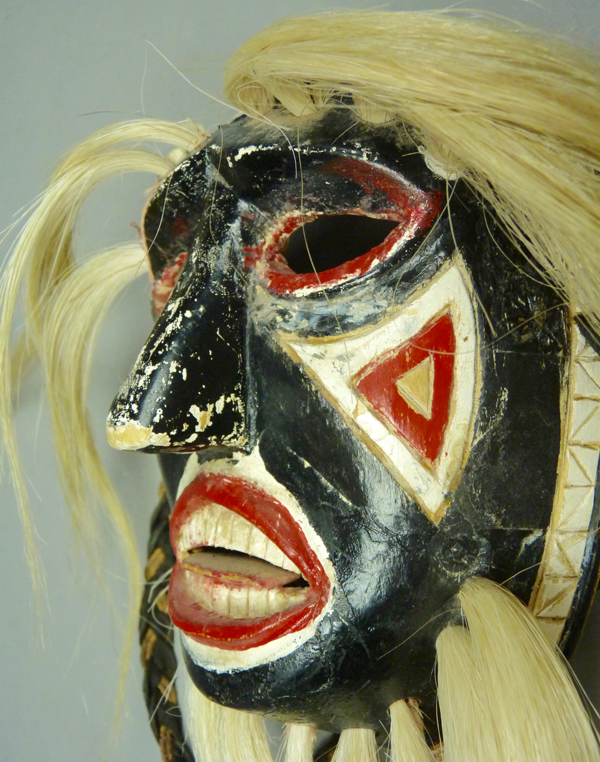 I bought today’s attractive and highly unusual mask from my friend Tom Kolaz in 2014. His runner had found it in the Rio Mayo area of Sonora. At that time it was still being danced. 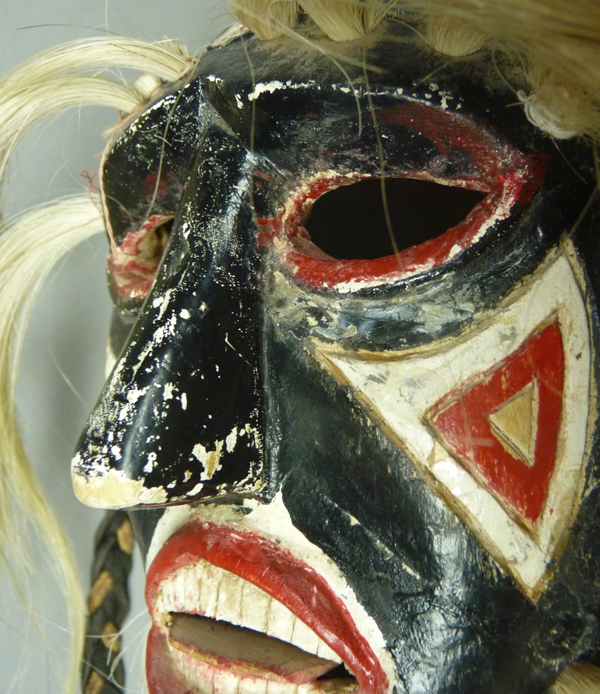 The Moroyoqui family of Sonora had originally purchased it circa 1940, it had remained in that extended family until the time of purchase, and the carver was said to be Gerardo Arce, an individual whom the family identified as someone who had carved more than one mask. Gerardo is otherwise unknown to either Tom Kolaz or myself. There are two possibilities here; either Gerardo is a newly identified master carver of great talent, or the carver was actually someone else and the family’s report is in error. 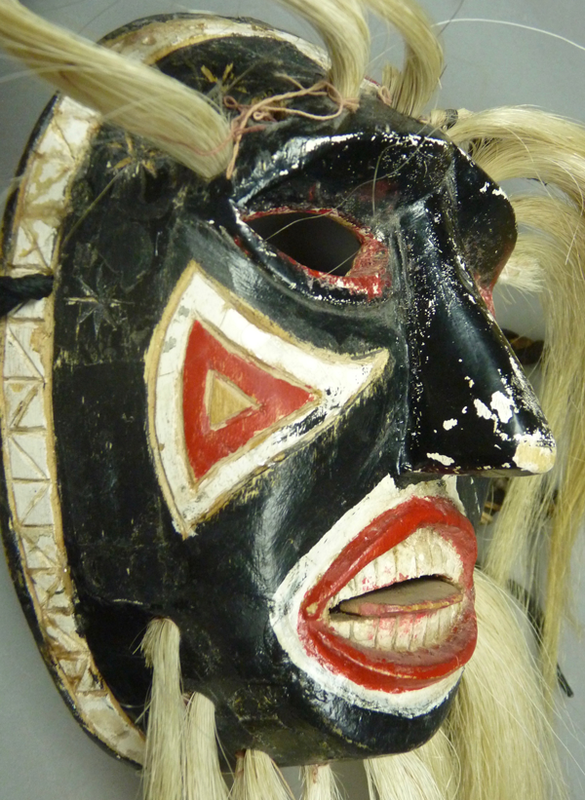 The problem, as you may recall from my earlier posts about Yaqui Pascola masks, is that these attributions by sellers frequently appear to be erroneous, when one compares a given mask to those of well recognized carvers. 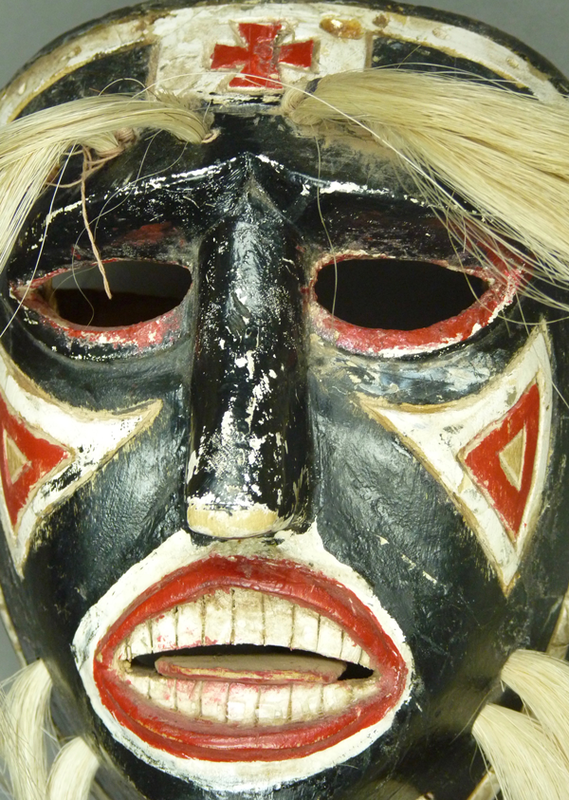 The shaping of the joint between the top of the nose and the forehead of this mask resembles the style of Pancho Parra, whose masks were the subject of my last two posts. 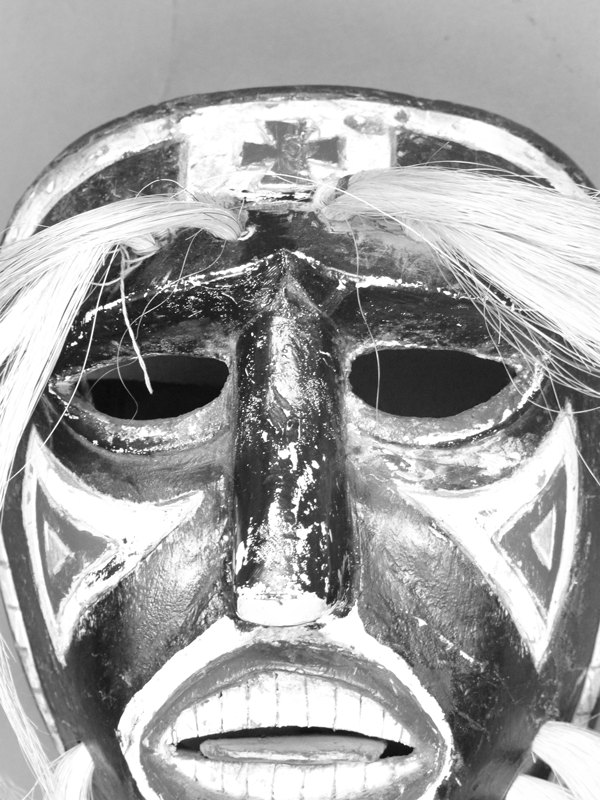 However, the mask is otherwise different from those of Pancho in various respects, with some features that seem m/l generic in the Rio Mayo tradition, others found on older anonymous Mayo Pascola masks, and the unusual forehead that seems unique to this mask. To my eye this mask is a masterpiece. 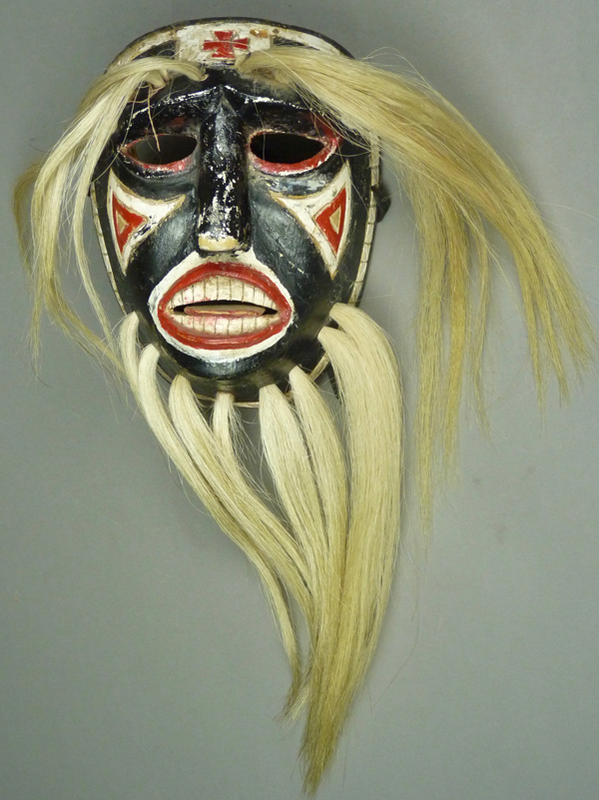 In general, this mask is clearly in the Rio Mayo style, with an oval shape, moderately long hair bundles for the brows and beard, almond shaped eyes, decorative painted design elements that flank the nose, and a slightly open mouth. It may or may not have originally had a tongue. This tongue is a separate wooden element that has been inserted between the teeth and secured with a nail, a traditional variation found on a few other Mayo Pascola masks. The artistry of the carving and decoration make one think of one of the premier Yaqui carvers of the mid-20th century, Manuel Centella Escalante. Having said this, one must add that the forehead cross and the rim design look nothing like his work. One would be more tempted to think that a Mayo carver saw a Centella mask and was inspired to copy some aspects of his style. 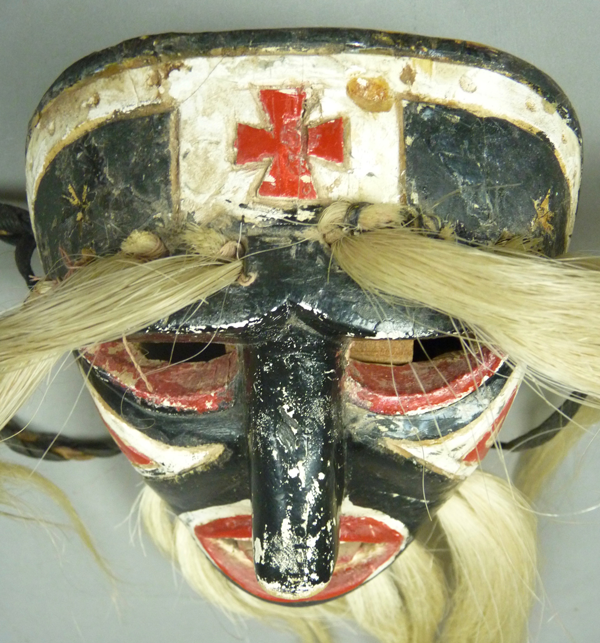 Most unusual is the manner of carving the area of the mask where the top of the nose meets the forehead. The nose resembles those carved by Pancho Parra, while the dramatically shaped forehead looks like nothing that I have seen on any other Pascola mask, Yaqui or Mayo. 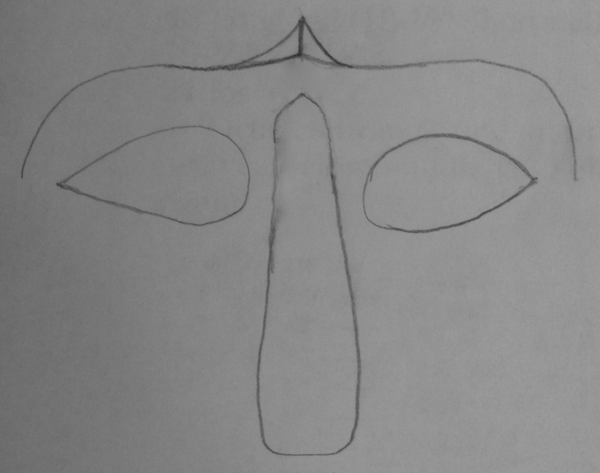 I have made a simplified sketch to draw your attention to the salient features, while exaggerating the separation of the top of the nose from the forehead notch. Actually the top of the nose nests within the notch. Here is two photos to compare to this drawing. 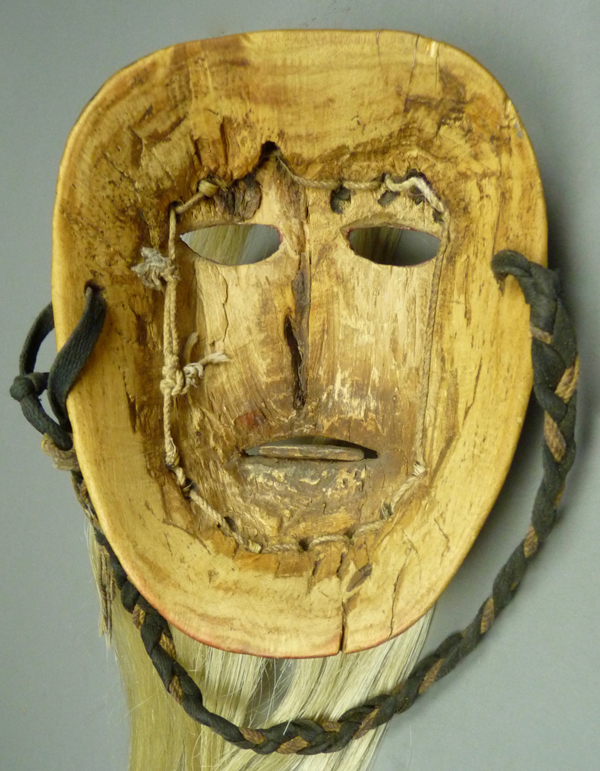 Having just closely examined nine Pascola masks by Pancho Parra in recent weeks, I am very aware that he is one of very few Mayo carvers who pay such attention to detail, particularly in this area of the mask. Here is another view. This is a simple but elegant Rio Mayo style nose. Note the rather plain rim design, which was carefully carved. Even more carefully carved were the lines outlining elements of the cheek design, which is simultaneously oriented to the eye and the nose. Here is another close-up view. A view from the other side follows. These side views clarify but also confuse the eye. Let’s re-orient from above. The forehead cross resembles those of Pancho Parra, but this one is framed in a white rectangle. Flanking the cross there are three small stars or flowers, which are actually more easily seen in the earlier side view. Sewa (flowers) represent the blooming “flower world,” that surrounds the Yaqui and Mayo towns (the Sonoran desert). In this view from below we become aware of how pointed the top of the nose is, and how this point mirrors the forehead notch. 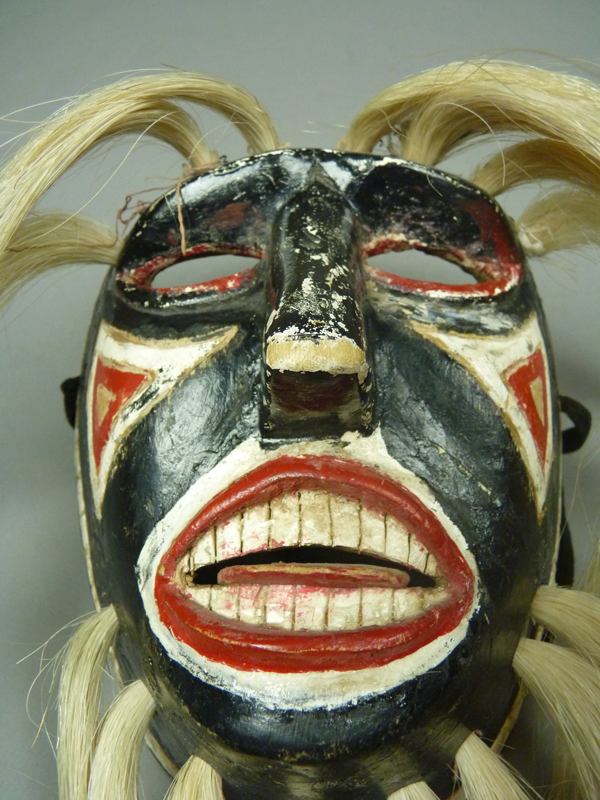 This mask is 7¼ inches tall, 5 inches wide, and 3 inches deep. This is yet another old mask that was darkly stained from very long use and then probably cleaned or sanded to make it look more presentable. Next week I will introduce you to another Rio Mayo carver, Bonifacio Baumea Sauzamea.